Tennis players always was their shorts, shirts, and socks; but how many regularly wash their sweat-soaked hats? Few. But should you and how do you? According to an article in the Chicago Tribune, some caps are made to be washed; other cheap versions are hardly worth the bother. Before you decide, they suggest you look at your hat. 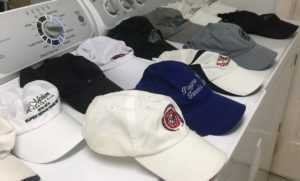 “A cap almost has to be constructed in a way that’s conducive to washing,” says Patrick Qualls, one of the owners of AmeriCap, a North Carolina hat manufacturer (americap.com). He says check the material, examine how it is stitched, and look at the headband and the brim. If it’s well made — good-quality material, sturdy stitching, a plastic brim (and most caps made in the last 10 years fit that description) — it will be obvious and you can begin cleaning. If it’s a cheap hat with flimsy stitching and a cardboard visor, a good cleaning may spell its doom. Anything that cheap can be easily replaced. If the hat is stained, use a prewash stain remover. Then toss the cap in the washer and wash gently in cold water. No bleach. Or wash the hat by hand. Cool-to-warm water in the sink, mild detergent, gentle rubbing with a clean washcloth should do it. Rinse in cool water. Some people subscribe to the idea of using a dishwasher to launder a cap. The dishwasher isn’t as abrasive as a washer, or so the reasoning goes. Whirlpool, which knows about optimal use of kitchen appliances, doesn’t seem so gung-ho on the notion. Experts say NEVER put your hat in the dryer unless you plan to give it to your tiny-craniumed grandson. No matter how you wash it, let the hat air dry. Place it on some kind of form — a coffee can, a canister, your head — to help it hold its shape as it dries. How’s this for an important topic???!! What do YOU do? I wash my husbands hats and my visors all the time. I spray with spray and wash. If they are really dirty I let them sit for about 10 minutes and use a small brush, even an old tooth brush works. Then I throw them in the washer. You can buy hat forms in the dollar store and let them dry on that. Works great! I love it George! 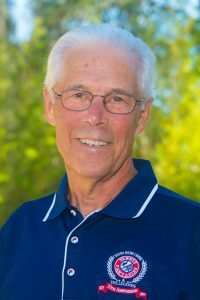 A “Good Housekeeping” version of “Senior Tennis” with cleaning tips and testimonials! …Not to mention how stinky those hats can become over time! Pew!Great article! You can also buy hat forms at Amazon.com that can be thrown in the washer. Besides the stink, sweat stains the hat. Good article George. OMG…..Can’t imagine not washing hats after each play…I have the white Nike hats that last forever…although the brim does start to get an orange stain from the clay. Wash in the washing machine with other tennis clothes…..then let air dry. However, the clean hat approach has not done anything to help my backhand return or serve or court coverage?!?! I always wash my hats after each wearing in the washing machine with hot water and then dry them in the dryer. The hats may fade in color a little and they shrink a bit, but with the expandable bands it is no problem. I have washed some of them over 20 times and have had no problems. After several years of wear it is time to replace them. A little “Shout” prewash spray, then in the dishwasher, works for me. Learned a while back that letting them air dry prevented that “raveling” on the brim from their being banged around in the dryer. We don’t use any kind of “form” for the drying – whether hanging or sitting on a counter – and they seem to hold their shapes just fine. Did you know that most neoprene support products are petroleum based and open cell? This means as you play in them, they are actually filling up with sweat like a sponge. Now imagine not washing these for extended periods of time, which is common place, because they take days to dry! Our most important features with body helix products are they are closed cell so they can’t fill up with sweat. They are not made from petrochemicals, and are latex-free. And here is the biggie…. They are made to be washed and put in dryer after every use! Body Helix products – you get what you pay for – I switched long ago to the BH thigh, knee, calf , ankle compression sleeves and find them much superior to the less expensive alternatives. Most dramatic effect was the shoulder sleeve effect after my fully separated rotator cuff repair surgery – besides significant physical discomfort post surgery, the fear of damaging the repair by some inadvertent movement, collision creates high anxiety for months post surgery. When I acquired and used the BH shoulder support, both the discomfort and fear of injuring the repair diminished significantly. I shared this with a local Virginia Beach player who also had shoulder surgery, lent him mine and the next day he ordered his own – obvious benefits. BTW, I am not an investor in nor compensated by Body Helix, just sharing my experience, opinion.